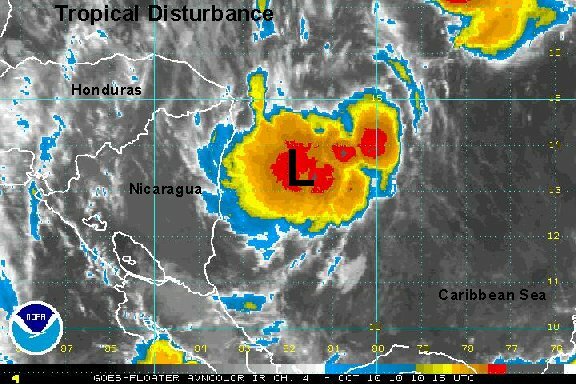 Tropical Depression 18 east of Nicaragua? For over a week forecast models have been hinting at some sort of low developing in the western Caribbean. It appears that there is enough of a spin and deep convection with the disturbed weather east of Nicagua to classify this as a tropical depression. A buoy north of the low is reporting winds gusting to near 25 mph and seas near 6 feet. As of 7 am edt / 6 am cdt the tropical disturbance was centered near 13.5° N / 81.8° W or about 100 miles southeast of the northeastern Nicaragua coast. Top sustained winds are estimated at 25 mph. Movement - northwest 5 mph. Pressure estimated at 1006 mb. Forecast models generally take this feature northwest over the next 2-3 days. 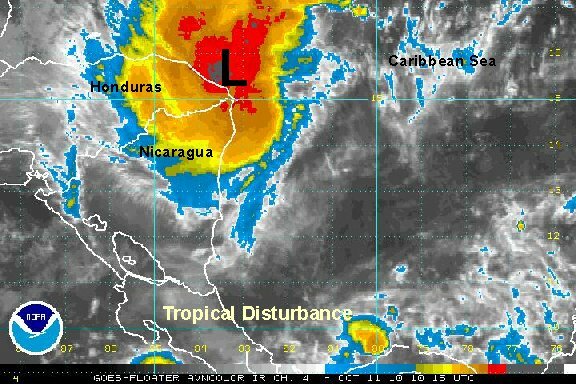 The low center should be near the coast of Nicaragua / Honduras late today /this evening, and north of Honduras on Monday. 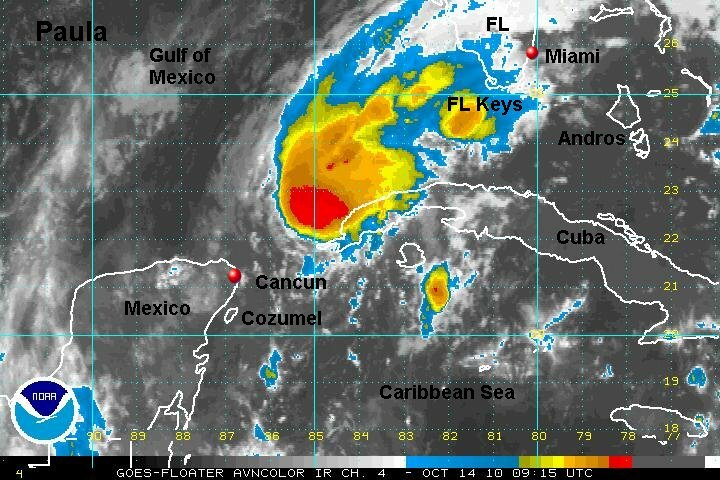 It is forecast to continue northwest toward Mexico by late Tuesday south of Cozumel. Remember, these are preliminary forecasts. Any interests heading to the northwestern Caribbean over the next several days should follow this feature. No change in the headlines. It still appears that we have a tropical depression, just barely offshore of the northeast coast of Nicaragua. Enough deep convection and spin are still noted on the satellite imagery. As of 6 pm edt / 5 pm cdt the tropical disturbance was centered near 14.3° N / 82.8° W or about 25 miles east of the northeastern Nicaragua coast. Top sustained winds are estimated at 25 mph. Movement - northwest 5 mph. Pressure estimated at 1006 mb. Forecast models generally take this feature northwest over the next 2-3 days. 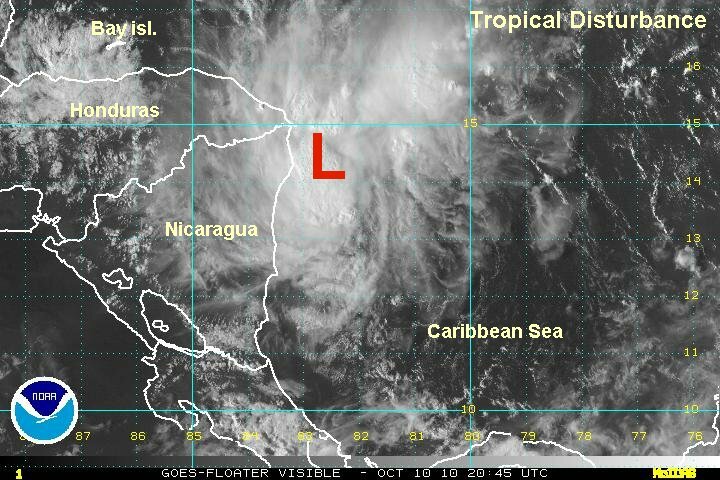 The low center should be near the coast of Nicaragua / Honduras into this evening, and north of Honduras on Monday. It is forecast to continue northwest toward Mexico by late Tuesday south of Cozumel. Cloud tops have cooled overnight indicating some possible organization. It is interesting to note that the hurricane center has kept this feature on medium to high alert status but has not classified it. It would be hard to see this system as only a mid level circulation having held together like this now for two days. Heavy to moderate rainfall is now occuring in eastern Honduras and northeastern Nicaragua. 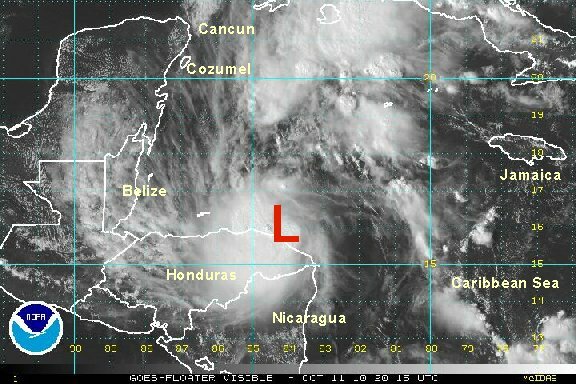 It appears that the low pressure area is elongated and another seperate low may be east of Nicaragua too. As of 7 am edt / 6 am cdt the tropical disturbance was centered near 15.6° N / 83.4° W or about 25 miles northeast of the eastern Honduras coast. Top sustained winds are estimated at 25 mph. Movement - northwest 5 mph. Pressure estimated at 1006 mb. Forecast models generally take this feature northwest over the next 2 days. The low center is forecast to continue northwest across the Bay of Honduras toward Mexico by late Tuesday south of Cozumel. A hurricane hunter investigated recently and the hurricane center quickly named the tropical cyclone that we has been following the past few days. The hurricane hunter found a 77 knot flight level wind. The surface wind estimate was 33 knots or under tropical storm force. It is a quesiton mark of the exact represented surface strength. we think that the strong winds of 77 knots were severe weather donwburst winds and not representative of the circulation yet. Because of this our wind estimate is lower than NHC's. As of 5 pm edt / 4 pm cdt tropical storm Paula was centered near 16.0° N / 84.0° W or just north of the eastern Honduras coast / 365 south southeast of Cozumel, Mexico. Top sustained winds are estimated at 50 mph (60 mph 5 pm hurricane center estimate). Movement - northwest 9 mph. Pressure estimated at 1000 mb. Forecast models generally take this feature northwest over the next 2 days. The low center is forecast to continue northwest across the Bay of Honduras toward Mexico by late Tuesday south of Cozumel. It is then forecast to stall in the northwest Caribbean. Interests in the northwest Caribbean need to follow Paula for the potential of it becoming a hurricane. Paula is definitely strengthening as it pulls away from Honduras. NHC's 65 mph looks like a good estimate. Paula will likely become a hurricane. The models have down well in predicting a low in the western Caribbean, but very poorly in the strenght of the low. The hurricane center upgraded Paula to a hurricane based on 65 knot winds at flight level and 62 knot winds at the surface. They felt that that hurricane force winds would be found if the whole area would be sampled. We disagree in this case. The pressure is only 992 mb. That is high for a minimal hurricane. The cloud tops have warmed indicating weakening. Paula looked more organized six hours ago when it was closer to Honduras. Because of this, we are estimating under the hurricane's center's strength at this time. A buoy not too far north is only measuring 20 mph winds and 4 foot seas. 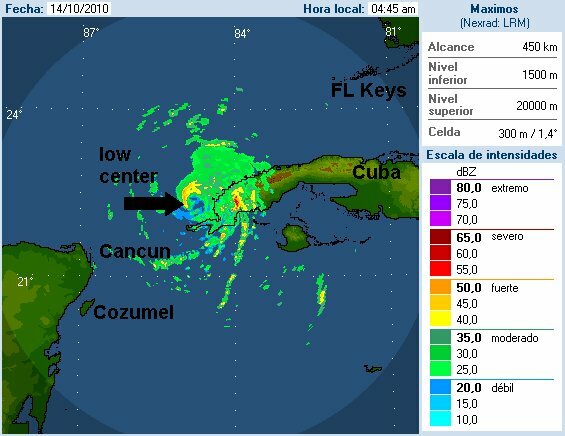 As of 7 am edt / 6 am cdt Paula was centered near 17.7° N / 85.3° W or 230 miles south southeast of Cozumel, Mexico. Top sustained winds are estimated at 65 mph (75 mph - 5 am hurricane center estimate). Movement - northwest 10 mph. Pressure estimated at 992 mb. Paula is forecast to move toward Cozumel then recurve eastward remaining in the northwest Caribbean. Dry air and wind shear are forecast to weaken Paula after the next few days. Interests in the northwest Caribbean need to follow Paula. Paula is roughly only about 175 miles wide....A very small hurricane. New visible satellite imagery shows that an eye has developed, so we now agree that Paula is a hurricane. The hurricane force winds most likely only extend 10-20 miles from the eye. A hurricane hunter has just found a 92 knot wind! The smaller the hurricane the faster it can weaken or strengthen. Paula is rapidly deepening. It started this morning and is continuing. Pressure has dropped 10 mb over the past several hours! 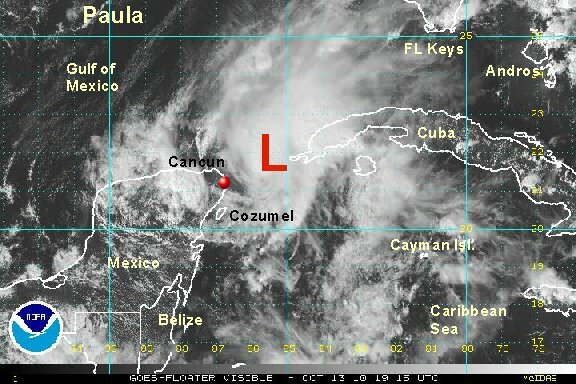 As of 1 pm edt /12 pm cdt Paula was centered near 18.8° N / 85.7° W or 140 miles south southeast of Cozumel, Mexico. Top sustained winds are estimated at 95 mph (75 mph - 11 am hurricane center estimate). Movement - north northwest 10 mph. Pressure estimated at 982 mb. the hurricane center just "upped" winds to 100 mph to closely match our estimate of 95 mph. The rapid deepening phase has ended and Paula has leveled off in intensity this evening, possibly even a little weaker. In an example of how small Paula is, a buoy a little over 50 miles from the low center is reporting 8 foot seas and 25-30 mph winds. Paula is heading in the direction that should take it just east of Cozumel overnight. 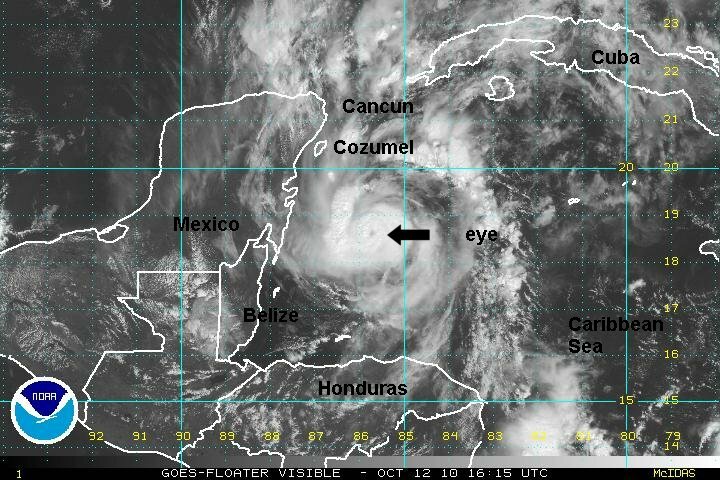 It's possible that Cozumel will not get hurricane force winds due to the fact that Paula is very small. 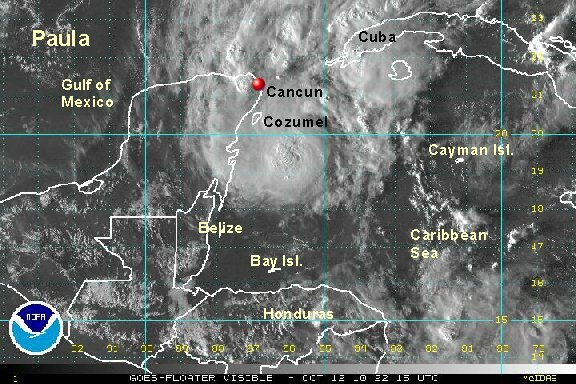 As of 8 pm edt / 7 pm cdt Paula was centered near 19.6° N / 86.0° W or 85 miles southeast of Cozumel, Mexico. Top sustained winds are estimated at 90 mph (100 mph - 8 pm hurricane center estimate). Movement - north 9 mph. Pressure estimated at 981 mb. Paula is forecast to move toward Cozumel then recurve eastward remaining in the northwest Caribbean. Dry air and wind shear are forecast to weaken Paula after the next few days. The forecast track is very uncertain after the next 1-2 days because of complex steering winds. Interests in the northwest Caribbean and Florida Keys need to follow Paula. 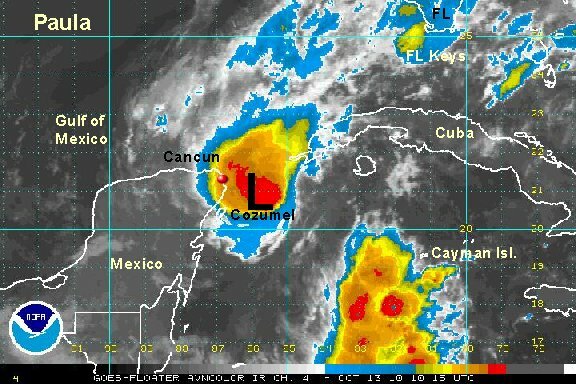 It appears that Paula's winds missed Cancun and Cozumel with Paula being such a small hurricane. Seas are predicted up to 22 feet by NOAA. Most of the northwest Caribbean has seas in the range of 4-9 feet. The highest seas are only in a very small area near the center of the hurricane. 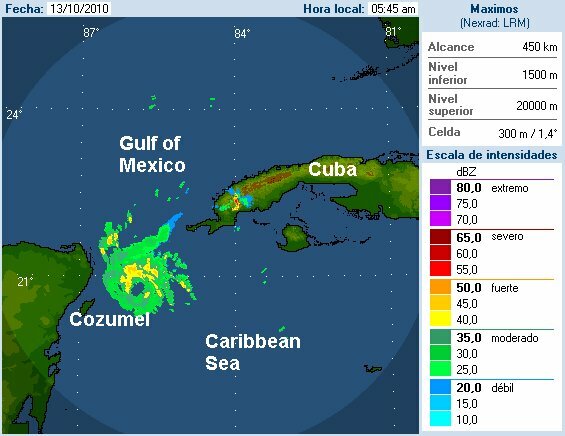 As of 7 am edt / 6 am cdt Paula was centered near 21.1° N / 86.0° W or 70 miles east northeast of Cozumel, Mexico / 90 miles southwest of the western tip of Cuba. Top sustained winds are estimated at 90 mph (100 mph - 5 am hurricane center estimate). Movement - north 9 mph. Pressure estimated at 984 mb. Dry air, wind shear and the proximinity to land are forecast to weaken Paula by tonight. Satellite imagery is showing that Paula is being sheared. 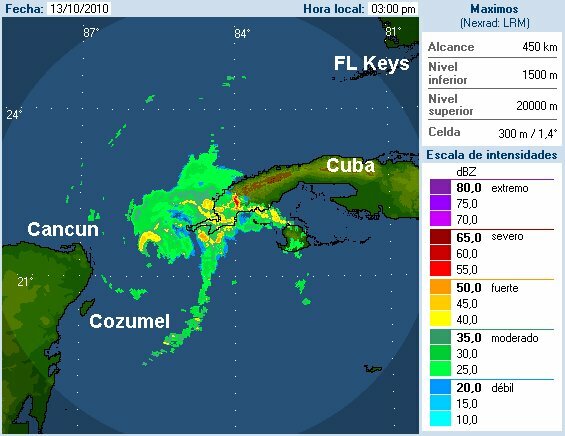 Radar is indicating that the eyewall is becoming more ragged. Finally, the hurricane hunter recon is showing a significant rise in pressure. All of these factors point to Paula weakening. NOAA estimates seas at 12 feet or less near the eye of the hurricane. It is likely that Paula will lose hurricane status overnight tonight. As of 5 pm edt / 4 pm cdt Paula was centered near 21.7° N / 85.6° W or 45 miles west of the western tip of Cuba. Top sustained winds are estimated at 80 mph (85 mph - 5 pm hurricane center estimate). Movement - north northeast 5 mph. Pressure estimated at 992 mb. Dry air, wind shear and the proximinity to land will continue to weaken Paula. Interests in Cuba should continue to follow Paula. Paula is close to the western coast of Cuba and continues to weaken. The hurricane center is leaving the windspeed up at 75 mph because of a flight level wind found. We are estimating a lower wind speed due to the very high surface pressure of 999 mb. Typically a hurricane is classified around 980-985 mb. With Paula being very small those correlations may be out the window some, but probably not up to almost 1000 mb. As of 7 am edt / 6 am cdt Paula was centered near 22.4° N / 84.8° W or 15 miles north of the western tip of Cuba. Top sustained winds are estimated at 65 mph (75 mph - 5 am hurricane center estimate). Movement - north northeast 5 mph. Pressure estimated at 999 mb. 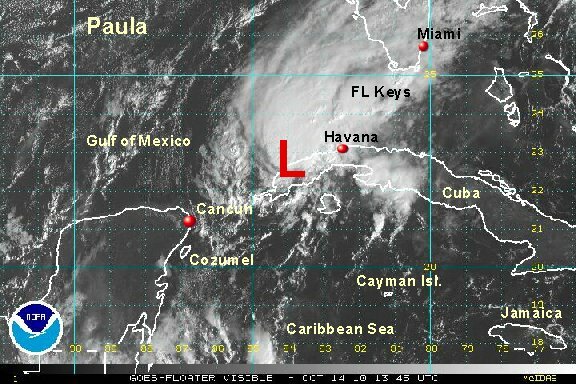 Paula is now over western Cuba. The eyewall has fallen apart. We believe that it is still significantly weaker than what the hurricane center is estimating. As of 11 am edt Paula was centered near 22.8° N / 84.1° W or over western Cuba. Top sustained winds are estimated at 55 mph (70 mph - 11 am hurricane center estimate). Movement -east northeast 6 mph. Pressure estimated at 1000 mb. There has been little change overall today. 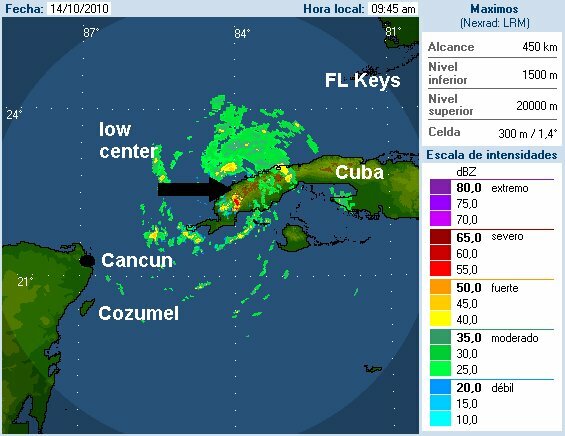 Deep convection remains over the north side of the circulation offshore of Cuba. A gust to 68 mph was reported at Puerto Esperanzo around noon. 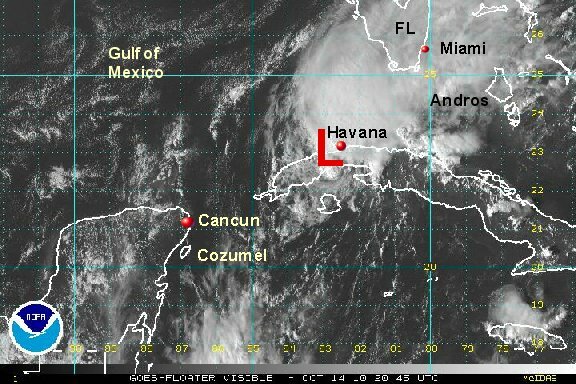 Havana currently only has winds at 23 mph and is not that too far from the center of the low. That would fit well with our estimate from 11 am. The low will gradually continue to weaken while over land tonight. 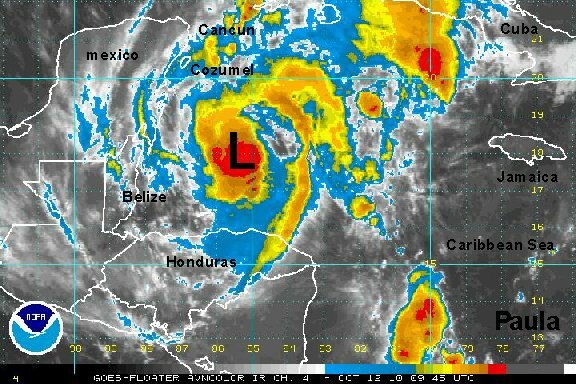 As of 5 pm edt Paula was centered near 22.8° N / 82.8° W or over western Cuba. Top sustained winds are estimated at 50 mph (60 mph - 5 pm hurricane center estimate). Movement - east 9 mph. Pressure estimated at 1002 mb. There is only one small cluster of thunderstorms still with Paula. This will be our last update unless regenertaion occurs.